Made by Agnes Mahoney. We are the original owner. Main fabric is black poly with black scattered ’sequins’. They aren’t really sequins, they are like pressed into the fabric. Pink satin has scattered pink glitter dots. 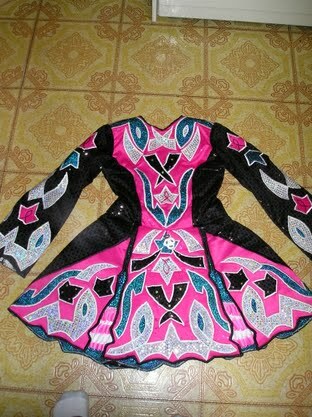 Lining is turquoise, comes with bloomers & head piece.